Sewing velvet is a strange experience. I’m working with a cotton velvet from a remnant table; it has a nice hand, but still crumbles and covers the table with fabric soot when I cut it. 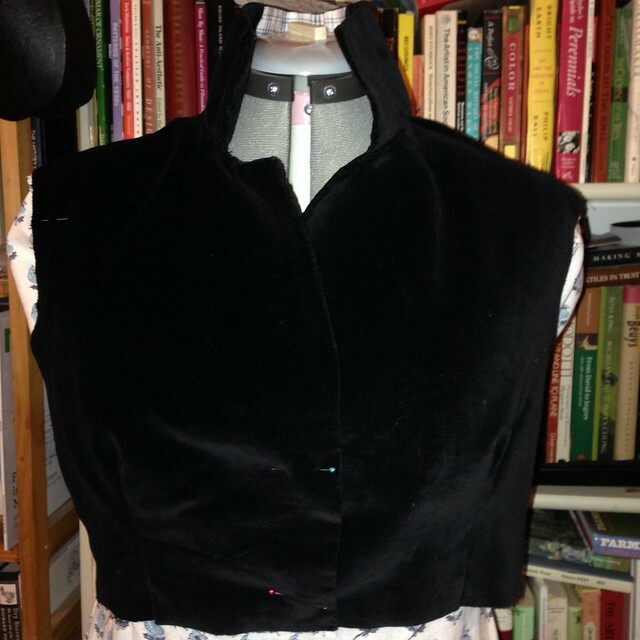 It’s not easy sewing black fabric with black thread, even in strong morning light, and “Some Velvet Morning” is an unhelpful thing to have stuck in your mind (especially the Lydia Lunch rendition). With just one yard of 44″ wide stuff, cutting a Spencer took a little doing and some minor piecing. I borrowed techniques from some waistcoats I’ve seen recently, and pieced in linen at the back collar lining. That seems to be pretty common, and makes sense from a wear and hair perspective. I patterned this on Monday morning before work, basing the pattern shapes on an 1810 fashion plate and an original at the MFA Boston. The MFA’s Spencer is particularly satisfying because of its connection to Lexington, Massachusetts. A New England-made Spencer is a happy find. HATE sewing, but boy does it look good when it’s done.